Bamboo Coffee Cups are a great alternative to traditional re-usable coffee cups. Often supplied to Universities, Coffee Shops and many Companies whom give them to staff or customers as corporate gifts. 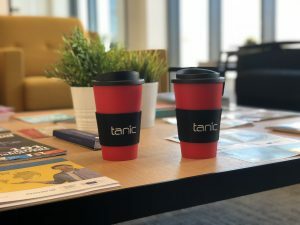 The cups are available in a variety of combinations of coloured lids, cups and silicone lids and can be custom printed to the Sleeve or in multiple positions on the cup. Here at Brandedcoffeecups.com we are pleased to be now offering a great range of environmentally responsible reusable coffee cup made with natural bamboo fibre – one of the world’s most sustainable resources. We supply our cups in 16oz and 20oz Cups. The Bamboo Coffee Cups are light, sturdy and fully dishwasher safe. It also has a resealable ‘no-drip’ lid. These cups are not suitable for microwaves.